Painting Oil on Canvas | 31.5" x 47.2"
Painting Oil on Canvas | 39.5" x 39.5"
Painting Oil on Canvas | 17.7" x 27.5"
I’m an artist who loves to know, sense and understand the colours I use. I believe they have a deeper meaning and they signify more than we give credit to them. This curiosity to understand colours has led me to do extensive research and more often than not, these musing of knowledge find their way on my canvas. For me, my work is spiritual and it’s in a constant source of development. I have an eye for detail and each detail in my compositions carry a message to the viewer. Zhanna Kondratenko hails from Ukraine. Her works have found homes across the globe. She enjoys experimenting with techniques and styles; hence her compositions often vary in presentation. 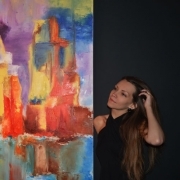 Zhanna believes that the painter plays the role of a philosopher who creates something with images, forms, lines and colours instead of words. Being the happy soul that she is, her works often contain bright vibrant tones in every style she paints, be it, landscape, abstracts or cityscapes.